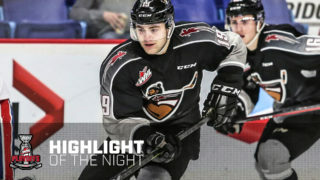 Tuesday night at the Langley Events Centre the Vancouver Giants (17-6-2-0) earned their third consecutive victory with a 5-3 come-from-behind effort over the visiting Saskatoon Blades (15-9-2-0). Davis Koch paced the Giants offense with two goals and an assist, extending his point-streak to six-games in the process. Milos Roman added a goal and an assist while Aidan Barfoot and Owen Hardy also added markers for the G-Men. Kirby Dach led the Blades offensively with a goal and an assist. Between the pipes David Tendeck stopped 23 of 26 for the Giants and was perfect from the second period onwards en route to his ninth win. Nolan Maier stopped went 23-for-27 at the other end for the Blades who are now 1-1 on their current B.C. Division road swing. The Saskatoon Blades exploded out of the gates Tuesday with two strikes in the first 6:51. 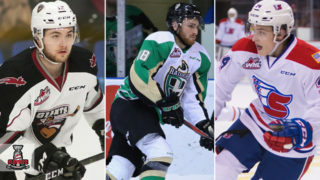 Top NHL prospect Kirby Dach got the Blades on the board with his 14th goal of the season. Dach’s goal came unassisted at 5:28. Josh Paterson then extended the Blades lead to 2-0 at 6:51 when he knocked home his own rebound for his seventh of the season. The G-Men answered when Jared Dmytriw’s centering pass deflected off Owen Hardy’s skates and through Nolan Maier. The referees reviewed the play, but deemed Owen Hardy’s fifth goal of the season a ‘good goal.’ Dylan Plouffe also assisted on the Hardy marker, extending his point-streak to six straight games. 59 seconds later the Blades regained their two-goal cushion when Max Gerlach tipped home a Dawson Davidson feed from in close on Tendeck for his team-leading 16th goal of the season. Shots were 10-9 Saskatoon after one. Michael Dyck’s Giants answered in a big way early in the middle frame, striking twice in the first 3:51 to even the score. First it was the red-hot Davis Koch who wired his seventh of the season past Maier at 1:49 on a power play to make it 3-2. Then at 3:51, Aidan Barfoot, who was suiting up in just his third game of the season followed up an Evan Patrician rebound and stuffed a backhand shot home for his first of the season. Vancouver outshot the Blades 12-7 in period two. Early in the third period the Giants power play delivered for a second time when Milos Roman knocked home a Davis Koch feed from in close for his team-leading 13th goal of the season to give the G-Men their first (and only) lead of the night. Bowen Byram added an assist on Roman’s eighth power play goal. The Blades had some good looks in the waning stages of the game, but David Tendeck did his part, keeping his team ahead. 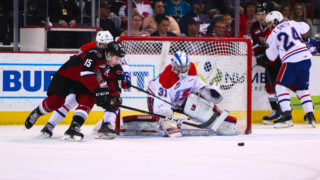 Davis Koch then ended all hopes of a Saskatoon comeback when he iced the game with an unassisted empty-netter at 19:46 to secure 17th win of the season for Vancouver. Davis Koch and Dylan Plouffe both extended their point-streaks to six games. With two goals and an assist, Koch now has five goals and eight assists for 13 points over the course of that six-game span. With an assist, Plouffe now has two goals and six assists for eight points over his past six games. 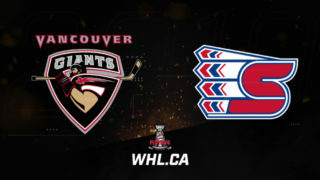 The win moves the Giants 12 points ahead of the Victoria Royals for first place in the B.C. Division standings. 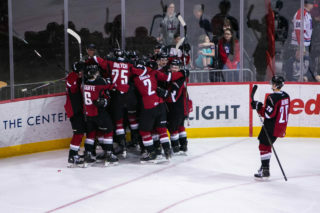 It also inches them back to within three points of the Everett Silvertips for first place in the Western Conference standings. The Giants hold two games in hand. Milos Roman has now scored goals in three straight games for the Giants. He’s added two assists in that span to give him five points over his past three games. The Giants power play improved to 10 for its past 32 (31.3%) after going two-for-three on Tuesday night.